When I was looking into getting started with making our own udder or teat wash, I found so many different and sometimes controversial recipes! A few important facts I really wanted to cover with our udder wash, was to use little to no chemicals while still getting rid of the bacteria and of course for it to be completely safe and healthy for our goats and sheep. Just in case you're interested, this is what I came up with and why. 7 drops of Lavender essential oil. I mix all ingredients in a measuring cup and then pour into a squirt bottle and give it a shake. I always shake well before each use. Spray each teat thoroughly and allow to sit for a few minutes before wiping the teats dry with a clean/dry washcloth. I have a stack of washcloths that are used only for teats and wash them after each milking. I chose GSE because of it's proven antibacterial qualities. I also chose to use Lavender essential oil for similar reasons... Lavender essential oil is not only antibacterial but an anti-inflammatory and an antiseptic too. In my opinion, every medicine cabinet should house a bottle of Lavender essential oil. It's wonderful stuff...not to mention it's a natural deodorizer and makes everything smell so lovely as well! 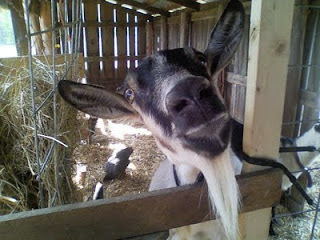 Maybe that's why the goat and sheep girls are always wearing a smile when they leave the milk barn. I also have a handy homemade udder salve to use as needed for dry or sore teats. It contains 1 cup of coconut oil and 30 drops of peppermint essential oil. Heat the coconut oil to a melting point and add the peppermint essential oil, then pour into a small container. Use with care on nursing mama's, since peppermint essential oil has been known to cause scours in kids/lambs and calves. These 2 products have worked so well for us and our milking flock and herd. No mastitis, clean milk and the girls udderly approve...hooves down!